illuminating like the brilliance of the skies the soul of Rob Pitts who went to his eternal place of rest. and bind his soul among the living, that he may rest in peace. And let us say: Amen. Rest in peace, Officer Pitts. You deserve your divine reward. Never forgotten. Rest in God's loving arms. Officer Pitts, thank you for your service in a mostly thankless job....you will live on in the memories of those you knew....you will now patrol the streets of gold. Your Brothers and Sisters in Blue will take the watch from here. Rest easy, Sir. Rest In Peace Brother in Blue. Thoughts and prayers for your family, friends and Brothers/Sisters in Blue. Matthew 5:9 Blessed are the Peacemakers for they will be known as the children of God. Lord hold his Family and brothers in blue in your hands now and in the times to come. E.O.W. Officer Rob Pitts, badge # 196. Report to St. Michael for your next assighnment. Rest easy my brother, we have the watch from here. Redondo Beach Police Dept. Ca. Retired / Winamac In. God Bless and Keep YOU BROTHER! 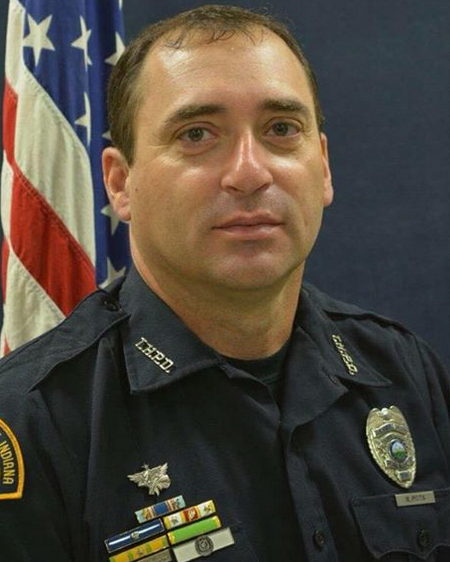 God bless you Officer Rob Pitts for your service and sacrifice. Thoughts and prayers go out to your family and friends, and to your brothers and sisters from the Terre Haute Police Department. Rest in Peace Brother. Rest with God officer Pitts. Your dedicated service and ultimate sacrifice will not be forgotten. Prayers for your family during this time in their lives.